Now that you have your Popcorn Hour C-200 (PCH-C200) setup to automatically download movies via CouchPotato and download TV shows via SickBeard, all that it takes is to wait for the movie or TV show to become available on the jukebox. If you set-up notifications, then simply wait for the notification to arrive. However, if you have different TV sets but only one C-200 jukebox, that presents a bit of a problem doesn't it? A very simple solution to this problem is to move the C-200 jukebox to the TV you want to watch at. Still, this solution is a bit cumbersome and will not work if two persons want to watch different content at the same time. The Digital Living Network Alliance (DLNA) is a non-profit collaborative trade organization established by Sony in June 2003, and has more than 250 member companies in the mobile, consumer electronics, PC, and service provider industries. Alliance members have stated the common goal of using standards-based technology to make it easier for consumers to use, share and enjoy their digital photos, music and videos. As of January 2011, over 9,000 different devices have obtained "DLNA Certified" status, indicated by a logo on their packaging and confirming their interoperability with other devices. It is estimated that more than 440 million DLNA-certified devices, from digital cameras to games consoles and TVs, have been installed in users' homes. This can be done several ways and there are several software available to accomplish this. This article concentrates on MediaTomb. 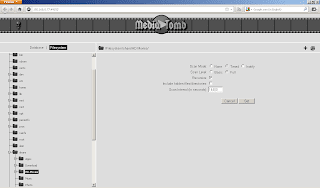 First of all download MediaTomb from its sourceforge download page. Consult the readme.txt file in the tar.gz file for dependencies. I use the "local" package from the CSI interface to satisfy dependencies. The avilable mediatomb package (v0.12.1) from "local" doesn't work for me. But the older static version from sourceforge (v0.11) works. There is also another pre-compiled mediatomb v0.11 from the NMT repository. All v0.11 packages work on the C-200 jukebox. The easier way is to download the mediatomb packaged binaries from the NMT repository. You can install this via the Community Software Installer (or CSI) using the "Install from Zip File" option. Mediatomb will automatically start upon installation via CSI. It will also generate its default database and config file. 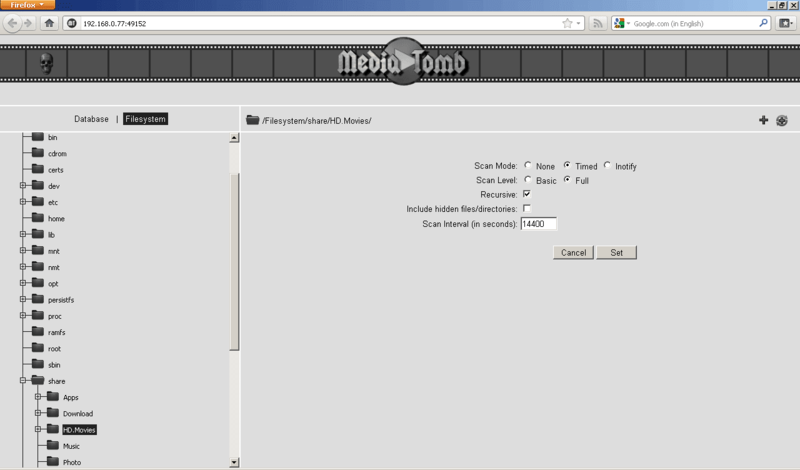 Mediatomb needs to be stopped as the default config will not make it function properly. You will find the installation under /share/Apps/Mediatomb and the corresponding config file is /share/Apps/Mediatomb/.mediatomb/config.xml. For better performance, look for the code <virtual-layout> and set the value to "disabled" (default is "builtin"). This is optional, but I find better performance out of this tweak. After making the above changes, start mediatomb (using mediatomb.sh start). Then launch a browser and point to http://C200-IP:49152/ (replace C200-IP with the IP address of your C-200 jukebox). The default username and password to access the browser interface is mediatomb and mediatomb. You can change those defaults inside the config.xml file. Browse the filesystem tree and add the paths that need to be added, scanned and/or monitored as media is added. Add to this configuration the paths of destination files for both SickBeard and CouchPotato. You can monitor errors via the log file. For my case I set Timed, Full, Recursive and every 14400 seconds on the directories/paths that I add for scanning/monitoring. 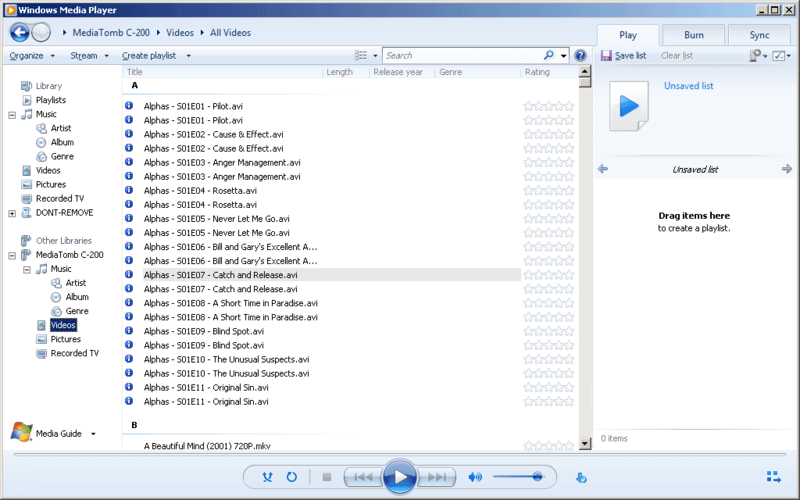 The glitch I found on MediaTomb is that it displays duplicate entries of files on Windows Media Player 12 library. You can see this better illustrated by the screenshot below. As you can see, each episode of the TV show "Alphas" is listed twice. Aside from that, the icons displayed seem to be generic and not video specific. I don't find these glitches very significant as long as the functionality I want is there. This duplicate entry issue is not present when viewing media listings on the LG and Samsung DLNA-enabled TV. Seems to manifest only with Windows Media Player 12. 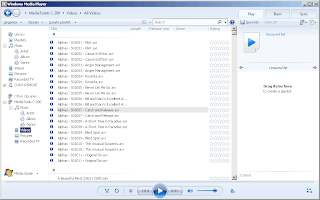 On Windows notebooks, I tested the streaming functionality on Windows Media Player 12 library and VLC v1.1.19, using the Advanced Open option to open media files.